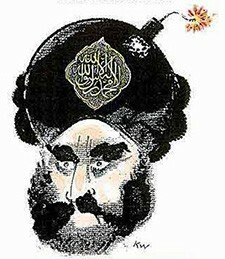 This cartoon of Muhammad by Kurt Westergaard, published on September 30, 2005, along with eleven others, garnered the most attention and anger. This month, Denmark's police foiled a terrorist plot to murder Kurt Westergaard, the cartoonist who drew the strongest of the Muhammad pictures, prompting most of the country's newspapers to reprint his cartoon as an act of solidarity and a signal to Islamists that their threats and violence will not succeed. This incident points to the Islamists' mixed success in curbing Western freedom of speech about Muhammad – think of Salman Rushdie's Satanic Verses or the Deutsche Oper's production of Mozart's Idomeneo. If threats of violence sometimes do work, they as often provoke, anger, and inspire resistance. 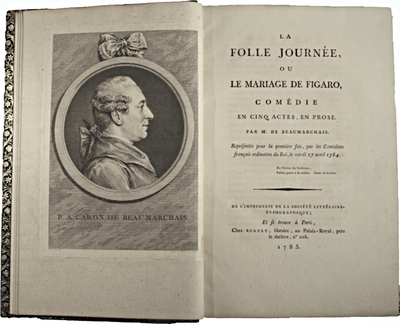 A polite demarche can achieve more. Illustrating this, note two parallel efforts, dating from 1955 and 1997, to remove nearly-identical American courthouse sculptures of Muhammad. 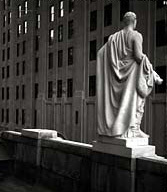 In 1997, the Council on American-Islamic Relations demanded that part of a 1930s frieze in the main chamber of the U.S. Supreme Court building in Washington, D.C. be sandblasted into oblivion, on the grounds that Islam prohibits representations of its prophet. The seven-foot high marble relief by Adolph Weinman depicts Muhammad as one of 18 historic lawgivers. His left hand holds the Koran in book form (a jarring historical inaccuracy from the Muslim point of view) and his right holds a sword. 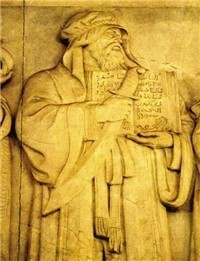 The Supreme Court frieze depiction of Muhammad. Official court information points out that "The figure above is a well-intentioned attempt by the sculptor, Adolph Weinman, to honor Muhammad and it bears no resemblance to Muhammad. Muslims generally have a strong aversion to sculptured or pictured representations of their Prophet." Chief Justice William Rehnquist, however, rejected CAIR's pressure, finding that the depiction "was intended only to recognize [Muhammad] … as an important figure in the history of law; it is not intended as a form of idol worship." Rehnquist only conceded that court literature should mention that the representation offends Muslim sensibilities. His decision met with riots and injuries in India. In contrast, back in 1955, a campaign to censor a representation of Muhammad in another American court building did succeed. 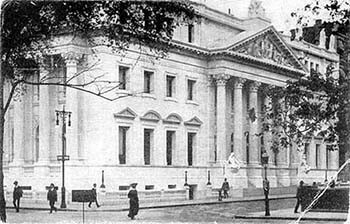 That would be the New York City-based courthouse of the Appellate Division, First Department of the New York State Supreme Court. Built in 1902, it featured on its roof balustrade an eight-foot marble statue of "Mohammed" by Charles Albert Lopez as one of ten historic lawgivers. This Muhammad statue also held a Koran in his left hand and a scimitar in the right. Though visible from the street, the identities of the lawgivers high atop the building were difficult to discern. Only with a general overhaul of the building in February 1953, including its statues, did the public become aware of their identities. The Egyptian, Indonesian, and Pakistani ambassadors to the United Nations responded by asking the U.S. Department of State to use its influence to have the Muhammad statue not renovated but removed. Characteristically, the State Department dispatched two employees to convince New York City's public works commissioner, Frederick H. Zurmuhlen, to accommodate the ambassadors. The court, Chief Clerk George T. Campbell, reported, "also got a number of letters from Mohammedans about that time, all asking the court to get rid of the statue." 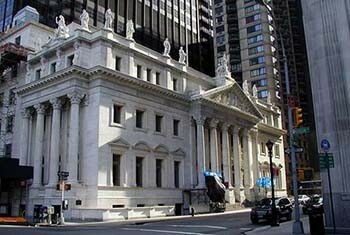 All seven appellate justices recommended to Zurmuhlen that he take down the statue. Even though, as Time magazine put it, "the danger that any large number of New Yorkers would take to worshiping the statue was, admittedly, minimal," the ambassadors got their way. Zurmuhlen had the offending statue carted off to a storehouse in Newark, New Jersey. As Zurmuhlen figured out what to do with it, the Times reported in 1955, the statue "has lain on its back in a crate for several months." Its ultimate disposition is unknown. Top left: The courthouse of the Appellate Division, First Department of the New York State Supreme Court, at Madison Avenue and 25th Street, New York City, photographed before 1955 from the southwest. Note the presence of a statue at the far right (east) of the building. Bottom left: The same courthouse, post-1955. Note the missing statue at the far right. Muhammad statue had been at the westerly end of the 25th Street side but the other statues on that side were moved one spot to the west in 1955, so that the empty plinth is now at the easterly end. Right: The New York Muhammad statue, described by the New York Times showing the prophet "of average height, but broad-shouldered, with thick, powerful hands. Under his turban, his brows are prominent and frowning. A long, heavy beard flows over his robe. In his left hand, he holds a book, symbolizing the new religion he founded, and in his right, a scimitar, connoting the Moslem conquest." The empty pedestal, where Muhammad stands no more. Then, rather than replace the empty pedestal on the court building roof, Zurmuhlen had the nine remaining statues shifted around to disguise the empty space, with Zoroaster replacing Muhammad at the westerly corner spot. Over a half-century later, that is where matters remain at the courthouse. Recalling these events of 1955 suggests several points. First, pressure by Muslims on the West to conform to Islamic customs predates the current Islamist era. Second, even when minimal numbers of Muslims lived in the West, such pressures could succeed. Finally, contrasting the parallel 1955 and 1997 episodes suggests that the earlier approach of ambassadors making polite representations – not high-handed demands backed up by angry mobs, much less terrorist plots – can be the more effective route. This conclusion confirms my more general point – and the premise of the Islamist Watch project – that Islamists working quietly within the system achieve more than ferocity and bellicosity. Ultimately, soft Islamism presents dangers as great as does violent Islamism. Mr. Pipes, director of the Middle East Forum, is suspending his column for several weeks. Auteur espagnol, je crois pouvoir y fronder Mahomet sans scrupule : à l'instant un envoyé... de je ne sais où se plaint que j'offense dans mes vers la Sublime-Porte, la Perse, une partie de la presqu'île de l'Inde, toute l'Egypte, les royaumes de Barca, de Tripoli, de Tunis, d'Alger et de Maroc : et voilà ma comédie flambée, pour plaire aux princes mahométans, dont pas un, je crois, ne sait lire, et qui nous meurtrissent l'omoplate, en nous disant : chiens de chrétiens. Being a Spanish author, I thought I had the ability to mock Muhammad without concern. [But when I did,] an envoy … from who knows where, immediately complained that my verses offended the Ottoman imperial court, Persia, part of India, all of Egypt, and the kingdoms of Benghazi, Tripoli, Tunis, Algiers, and Morocco. And so my comedy was torched to please the Muslim princes who call us "Christian dogs," …although none of them – to my knowledge – knows how to read. The front panel of Sound Vision's brochure. Nov. 2, 2011 update: Curiously, in light of CAIR's opposition to the Supreme Court's frieze of Muhammad, the Chicago-based Sound Vision Foundation celebrates the frieze in a brochure titled Prophet Muhammad Honored by U.S. Supreme Court as One of the Greatest Lawgivers of the World in 1935. As the United States Supreme Court judges sit in their chamber, to their right, front, and the left sides are friezes depicting the 18 greatest lawgivers of the world. The second frieze to the right features a person holding a copy of the Quran, the Islamic holy book. It is intended to recognize Prophet Muhammad as one of the greatest lawgivers in the world, along with Moses, Solomon, Confucius, and Hammurabi, and others. While the learned people in our country knew of the contribution of Prophet Muhammad, our neighbors today given regular doses of misinformation about the Prophet and Sharia, the path of the Prophet, more commonly described as Islamic law. Sound Vision then soars into flights of fancy about the biography of Muhammad, applying twenty-first-century mores to a seventh-century figure; note especially the bizarre and inaccurate references to "a mass peace movement" and "not more than six days." Prophet Muhammad envisioned a just and peaceful society. With a mass peace movement, he achieved this goal during his life. He hated war and always preferred a peace treaty with his opponents, even if it was not favorable to his and his followers' interests. He established his first peace sanctuary in the city of Madinah without any war whatsoever. While he did fight to defend that peace sanctuary, it is critical to note that the total time of actual fighting defending his people was not more than six days in his life of 63 years. He struggled to secure a peace that ensured justice and liberation for all people, especially for those most marginalized and oppressed. Comment: Islamists will say absolutely anything to advance their cause. Related Topics: Dhimmitude, Islamic law (Shari'a), Muslims in the United States | Daniel Pipes receive the latest by email: subscribe to the free mef mailing list This text may be reposted or forwarded so long as it is presented as an integral whole with complete and accurate information provided about its author, date, place of publication, and original URL.